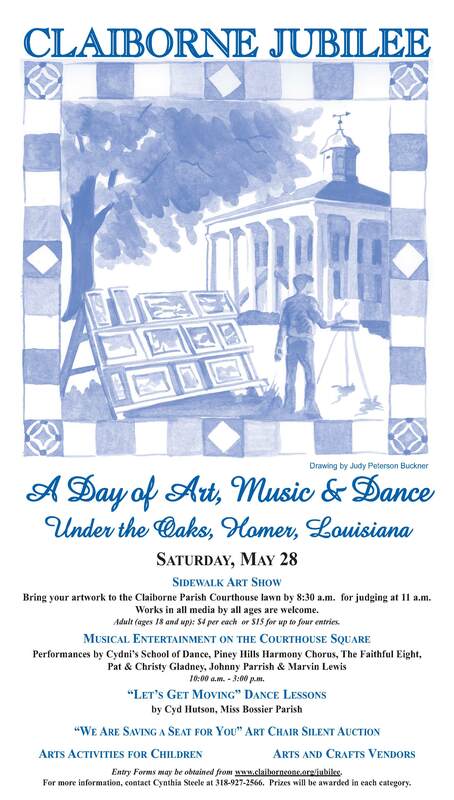 The Homer Courthouse Square will be host Saturday to talented students and professionals from throughout north Louisiana when the Claiborne Jubilee returns to its home after a year’s absence. Cydni’s School of Dance students will perform followed by Miss Bossier Parish, Cyd Hutson, who will lead all interested participants in learning various dance and “Let’s Get Moving” activities. Gospel musician Johnny Parrish will perform at 10:30 and Charles Etta Johnson’s ensemble, The Faithful Eight, will perform at 11:30. The Piney Hills Harmony Chorus will sing at noon followed by Pat and Christina Gladney. A variety of vendors will be on hand during the day selling everything from children’s furniture, porch swings and mayhaw jelly to jewelry and clothing. Several artists will be offering their work for sale as well as entering the competition for art prizes. Judging will begin at 11 am for works in the following categories: painting, drawing, photography, and other works; for the following groups: ages 7 and under, 8-12, 13-18, adult amateurs and adult professionals. Entrants should have their works registered and placed in the appropriate areas by 9 am. In addition to dance activities various hands on children’s art projects will be featured led by Lisa Giblin. Throughout the day there will be a silent auction featuring the chairs created for the “We’re Saving a Seat for You!” fundraiser. Plan now to join in the festivities to begin your Memorial Day weekend celebration. For more information contact Cynthia Steele at 318-927-2566.